When last we left our tour of the Walt Disney World Village we were at the doors to Cane, Rattan, Wicker & Suns, wondering where to go next. Since posting this image without comment is like putting up an image of the surface of the moon given how little the current area resembles this, allow me to isolate the relevant area of the image and provide some context. The structure we see in the most immediate foreground on the right is the Captain's Tower, an open air pavilion with a tall central spire which serves as the central landmark of the Village. The tower hosts special events such as art displays, celebrity appearances, craft fairs and so on. Darth Vader appeared here to promote Star Wars in 1977. The "Glory and Pageantry of Christmas" show, a sort of living nativity, was held here for a few years before moving to the Dock Stage. The central spire of the Captain's Tower was taken down in the mid-90's to convert the pavilion to a kids' clothing store. It was partially enclosed at this time. The pavilion was further enclosed to become Disney's Pin Traders in 2000. Much of the original structure still survives. In front of the Captain's Tower, a number of steps can be seen descending. These ended in a reflection pond. This was filled in with a kiddie train ride in the mid-1990's. In the middle distance on the left is the side of a shop which is now known as Pooh Corner. The original windows may still be observed to this day. 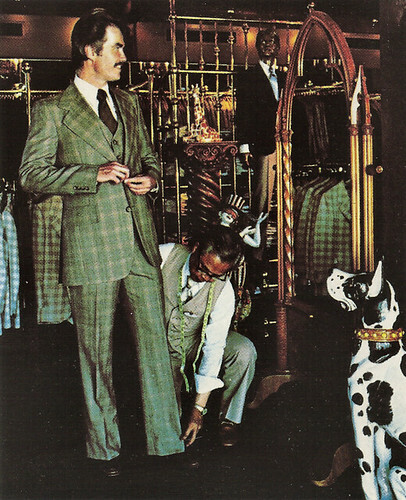 This photo dates from 1976 and this shop would've been known as Posh Pets at this time. In the background on the right we see a number of orange umbrellas belonging to the Gourmet Pantry, a sort of deli and grocery store. Behind those umbrellas: a row of windows looking into The Village Candy Shoppe, stocking a similar selection as Main Street's Market House. The Gourmet Pantry would later expand to fill this entire building, which was renovated into Mickey's Pantry in 1996, and closed in 2003 to make way for The Earl of Sandwich. In the very back of this we can see the side of what is now Disney's 13 Days of Christmas, but which then housed Toys Fantastique, an import toy store. On the right, just out of view, is Heidelberger's Deli, a dark toned little corner eatery offering dark rich German beer and large sandwiches. But we'll save all that for later. Let's pop into the dimly lit little chalet to our immediate right just past Port of Entry, known as Sir Edward's Haberdasher. It is more or less what is expected, although an interior view like this is today very rare. In 1989 this little building was brightened up considerably and reopened as Harrington Bay Clothiers, as generic a menswear shop as can be imagined. The whole building was bulldozed in 2000 to make way for the Once Upon a Toy Hasbro shop. It's time to stop by the Flower Garden to pick up a fresh flower arrangement. 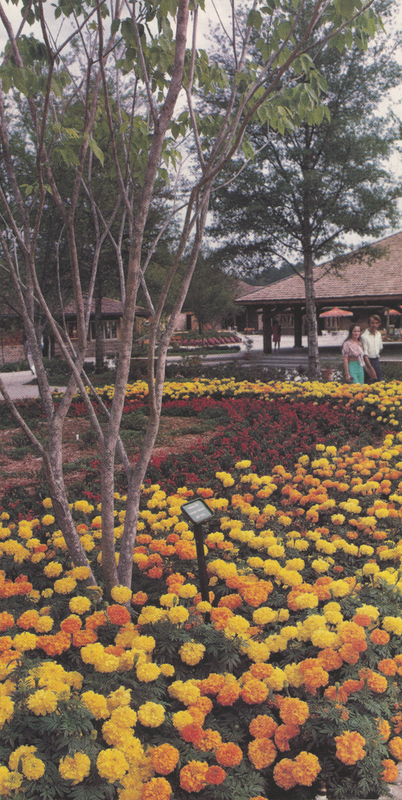 The Flower Garden also sells cacti and is the centerpiece of the Village's yearly Easter celebration, as well as the annual Village Flower Festival, a tradition which would be expanded in the 1990's to become the EPCOT Flower & Garden Festival. 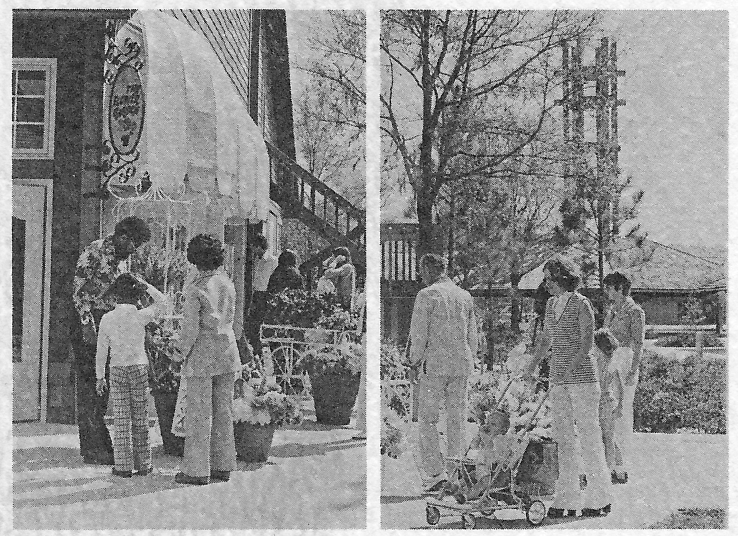 Speaking of which, starting in 1979, the Walt Disney World Village is going to host a Wine Festival, with the Village Spirits and Vintage Cellar shops as the focal point of this event. Later this would move to the Lake Buena Vista Convention Center, and finally to - you guessed it - EPCOT. The Village's distinguishing feature was, in fact, her beautiful craftwork signs. 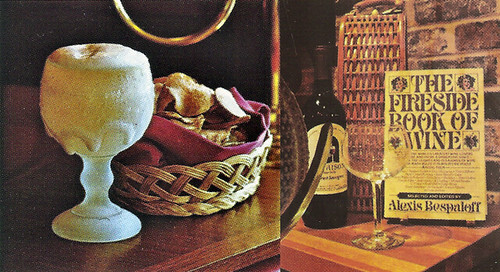 Captain Jack's dropped the oysters in 2000 and became simply a "restaurant"; the Windjammer Dock Shop vanished in the 1990's when Captain Jack's expanded its seating into its old waiting area and the shop became a very narrow reception room. Miss Merrily's Fashions is the second name of a designer clothing shop known as Miss Merrily's Madness; it catered to hip young girls. We've reached the far end of the Village. Time for dinner at one of the best restaurants on property! 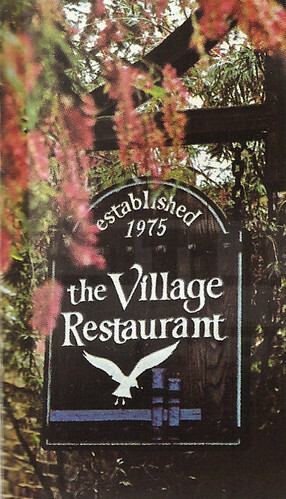 The gull on this sign is also the inspiration for the logo of the Village itself, a silhouetted bird flying across a blue circle. 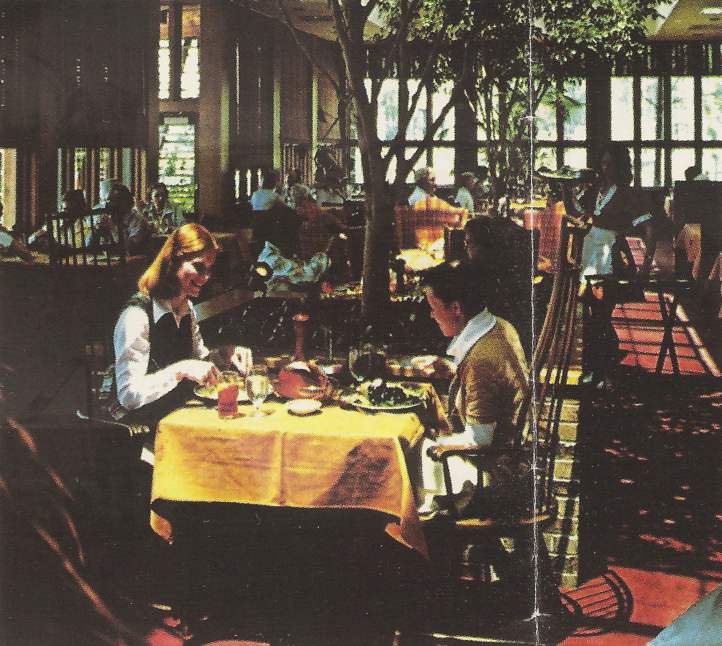 The open dining room of the Village Restaurant is big on sunlight, skylights, and false trees. See that recessed seating area at the back on the left? This gentleman is being treated to an unexpected fashion show, direct from Country Address! Did he buy that pipe at Pipe Dreams earlier today? The restaurant is tastefully decorated with the same weathered bricks which the rest of the Village is built with, with burnished wood tones and blinds. One bank of windows look out on a private canal which divides the Village from the Townhouses of the ambitious Lake Buena Vista community building effort, and the hotels of Lake Buena Vista down the way - Old Dutch Inn, TraveLodge, Howard Johnson's and others. 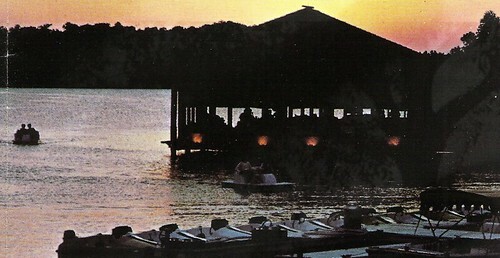 The other windows look out on the Village Lagoon, and diners can watch guests paddle by in rented boats. This view is also shared by the Village Lounge, a hot spot for Jazz performances at night. Night falls on Lake Buena Vista. Aren't you glad you took the time to enjoy this quiet corner of the World? The Shopping Village. Walt Disney World's newest addition. So different. So unique. So exciting. Only the Disney people could've done it. Just ten minutes away in the Host Community, Lake Buena Vista. At the Village, you'll watch Old World craftsmen at work with pottery. Crystal cutting. Toledo gold engraving. You'll discover European and Oriental antiques. Candle crafts. Custom-blended tobaccos. Designer originals. And posh pets. You'll savor the flavors of imported beers in frosted mugs. International cheeses. Oysters on the half-shell. Fresh-ground coffees. And tasty homemade candies. You'll explore 29 cedar-shingled shops and four distinctive restaurants clustered on the banks of a beautiful blue lagoon. After you've seen the Magic Kingdom. See the Village. Today. Or on your way home tonight. Open every day 10 till 10." 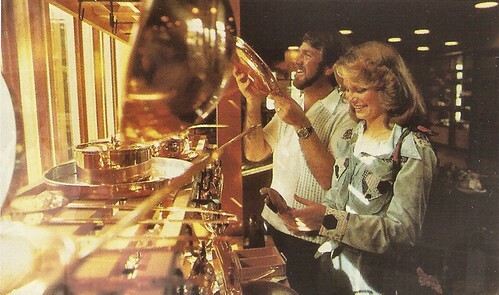 - Walt Disney World Village promotional flier, 1975. The Walt Disney World Village List - every shop, in chronological order. Widen Your World - my writeup on the history of the Village for the internet's definitive WDW history resource. My Flickr Account - with hi-res versions of all of these photos. Since I've become something of the current expert on the Walt Disney World Village, due to my many years of interest in it and my obsessive desire to catalog every shop which ever put up a sign there, I've decided to put up a special treat tonight. The Walt Disney World Village does *move* me in ways that much of Walt Disney World does not, partially because I experienced so little of it when it was in something near her original state, and partially because I feel that it is the single most indicative element of Walt Disney World to be tampered with. Where once there was a funky, unique, forward-thinking little part of Walt Disney World, Eisner swept in and transformed it into... a pretty ugly outdoor mall. But I'm not here tonight to complain about the Village now, I'm here to honor what it was then. Since many current Walt Disney World frequenters know about as much about the Walt Disney World Village of 1977 as mankind does about the dark side of the moon, I hope this pictorial tour will help bridge the gap between the abstraction of "1979 = Walt Disney World Village, 2009 = Downtown Disney Marketplace" and the actual sights, sounds, colors and textures of a true Walt Disney World extinction. 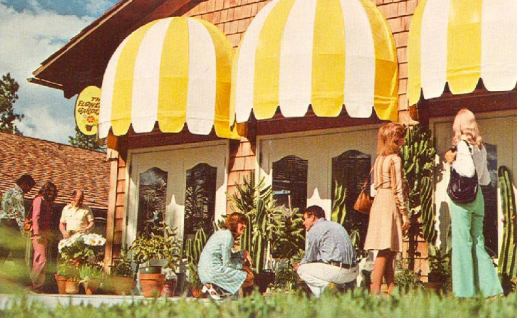 No major component of the Florida Project has been obliterated as fully as the City of Lake Buena Vista, so let's enjoy a look back in time to another era in Disney design. 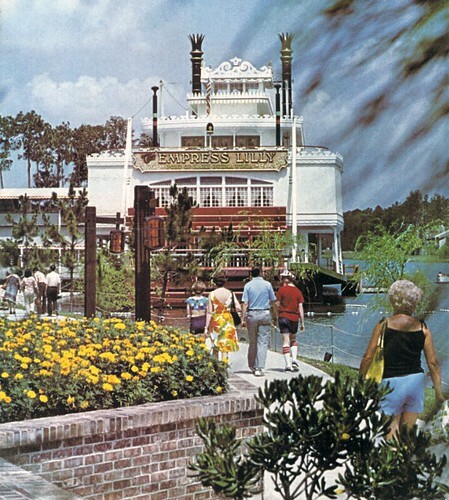 The Empress Lilly opened in April 1977 along with a new restaurant complex on the northern shores of The Village Lagoon, an already manmade waterway which required extensive digging out to "anchor" this massive building which housed no less than five restaurants and four lounges. 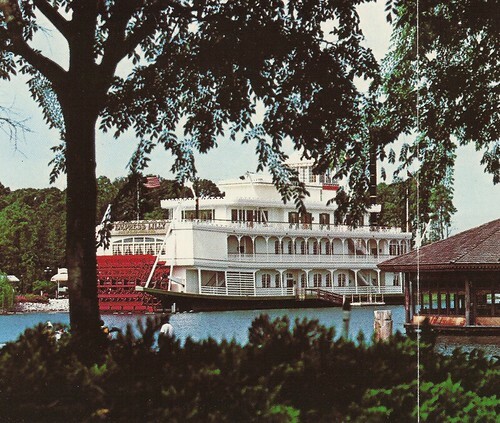 Unlike the Mark Twain or Richard F. Irvine in the theme parks, the Empress Lilly was the real thing, a full-sized, graciously-appointed riverboat, her red paddle always turning, ready to steam out into the Florida wilderness at any moment. 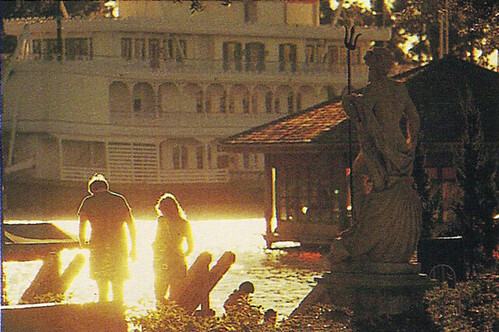 While this view can still be had, from near the front of what is now Team Mickey's, what should be especially shocking to current Walt Disney World visitors is the untouched Florida wilderness behind the Lilly instead of the supremely ugly expanses of Pleasure Island and Saratoga Springs. This is the way she was meant to be seen, a striking manmade wonder amid natural splendor. The dock you see on her side, since converted to be outdoor seating for her current tenant, is where silent, peaceful flote boats from the nearby Lake Buena Vista Club would tie up to let passengers off into what was then known as the Starboard Lounge, a quiet little nook where one could look out across the water at Captain Jack's Oyster Bar. 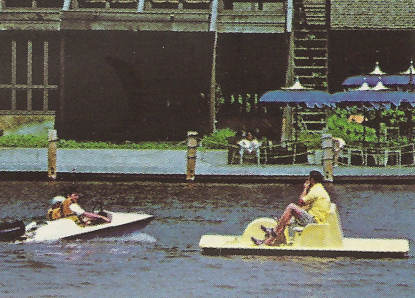 This was a privae boat service connecting only to that dock; everyone else would have to take a motorized boat to Cruise Dock West, near what is now Rainforest Cafe but which was then The Village Restaurant. This shot just kills me. This view is totally gone now, one of Walt Disney World's greatest vistas. In the distance on the other side of the lake on the right are visible the Club Lake Villas, the second stage expansion of the Village Resort. These unassuming little structures would last until 2002 as the Disney Institute "Bungalows". Take some time to admire the gorgeous craftwork lanterns, hung on sturdy posts, which once proliferated along the waters' edge of the Village Lagoon. That little buoy barrier surrounding the Empress Lilly's paddle is still there, despite Levy Restaurants' removal of the paddle in 1996. The sign reads "The Empress Lilly - Port of Lake Buena Vista". The top deck of the boat facing us housed the "Texas Deck Lounge", a huge bar with "tub" seating and a spacious outdoor deck facing the Village and points beyond. The windows just one level down hide from us the Empress Lounge, the waiting area for the exclusive gourmet Empress Room, with live harp music nightly. And those bottom windows, so near that churning red paddle, provided a great view to diners at the Steerman's Quarters, a premium steak house. 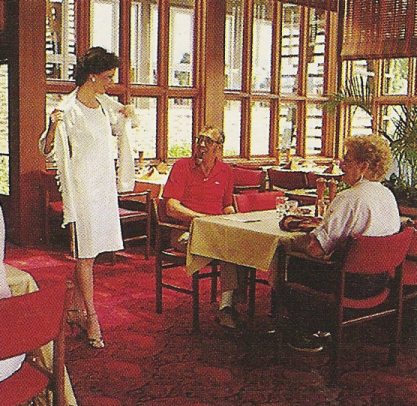 The Empress Lilly was renovated (gutted) in 1996 by Levy Restaurants, who today operate it as Fulton's Crabhouse. Disney signed a twenty year lease with Levy, so the restoration of the Lilly to her original state is not likely in the future. Those two old folks on the right are just leaving the Verandah Restaurant, having just enjoyed a leisurely, casual dinner. Perhaps the gentleman ordered the prime rib special, or maybe just a sandwich. They're now descending a brick-lined flight of steps, while those two older ladies examine the menu. If one doesn't feel like partaking inside the large central area of the Verandah, there are counter-service sweets available to both the left and right of the hexagonal building. To the left is the Village Cone Shop, and to the right is the Sara Lee Bakery. The building which once housed the Verandah still exists, although the steps have been eliminated and the pedestrian walkway now runs on the same level as the old couple on the right. It now houses the Lego Imagination Center, and the little hexagonal side room which once housed the Cone Shop was leveled. The space for the eatery on the other side was retained and is now where kids can fill a bucket with LEGO bricks. The main door to the shop is now nearer the former site of the Cone Shop. Where the front doors on the Verandah were is now a series of displays of LEGO dioramas. In the very background of this picture we can see the Pottery Chalet, the tallest building in the little cluster of shops which made up the Village. Let's go inside! 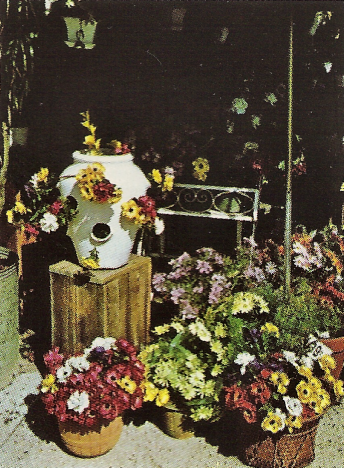 Now, about the Pottery Chalet. It wasn't really a single shop so much as a collection of many sub-stores, some of which had to do with pottery, and some which... didn't. It had an open courtyard on its' south side with shop space all around. In the middle of the Chalet was the potter, a live person working a potter's wheel. Much of the pottery sold in the shop was thrown right at the Village, and a custom pot could be made for you as well. 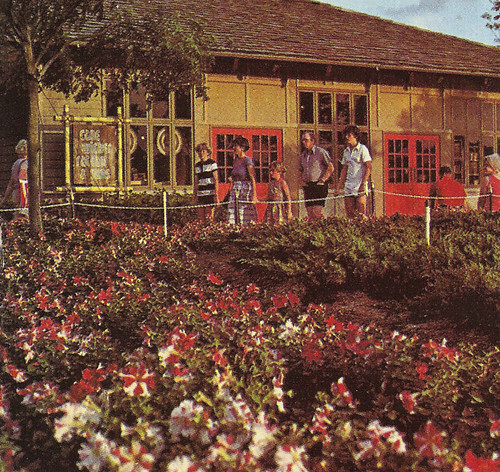 If you look closely at the image above, you can see that in its' early years the Pottery Chalet was open in the front. Only later was it glass enclosed. Inside the Pottery Chalet has a collection of all sorts of items... the best way to succinctly describe the Village's mega-store was that it was devoted to "housewares". One could buy everything from candles to fine china. Here we are in the courtyard of the Pottery Chalet complex. Such gorgeous pottery! Disney's even thoughtfully included plants in many of these pots. See that little garden cart over on the left? Let's go examine that closely. Unlike on Main Street in the Magic Kingdom, these are real flowers. 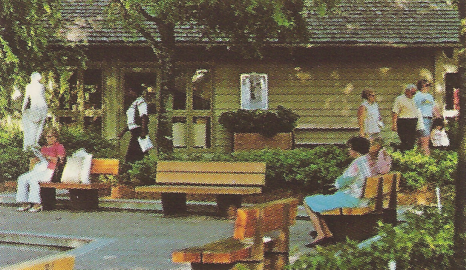 The Walt Disney World Village was intended to serve locals as well as the future residents of Lake Buena Vista, the city which would grow out of the "downtown" of the Village. Who of course, like many of the artists at the Village such as the potters, florists, crystal carvers and gold inlayers, held ongoing demonstrations. 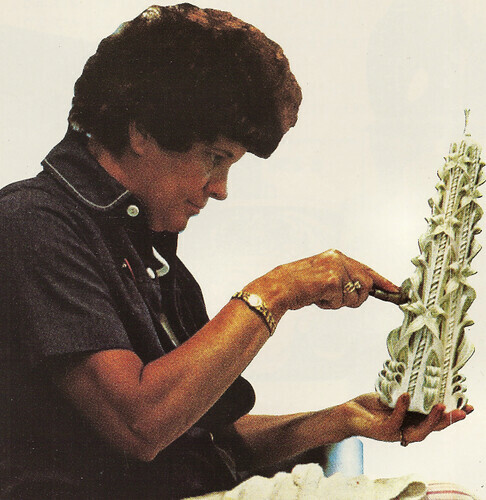 Some of the candles carved and sold in the Candle Chalet were also available in the Magic Kingdom in the Wonderland of Wax store on Main Street. Our couple has found the kitchen wares section of the Pottery Chalet! The guy in this picture looks much happier in this part of the store... the Pottery Chalet also sold place settings, linens, flatware, and even kitcheny brick-a-brack. These folks are enjoying some down time nearby, outside the Chalet at the Dock Stage, with its' stepped viewing area. The building in the background is likely the side of Lite Bite, the Village's burger-and-fry outlet. Also visible on the left is one of the Village's many "Mediterranean" statues which dotted the picturesque Lagoon. 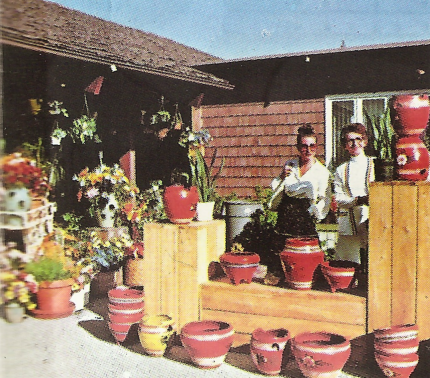 The Pottery Chalet slowly was consumed by the Christmas Chalet in later years, and was eventually demolished in 1995 to make way for the World of Disney. This also involved destroying the original Dock Stage and rebuilding it with bleacher seating. That incarnation went away earlier this year as Disney built a new, covered, high end stage where once the sedate Dock Stage was. The first picture of the Pottery Chalet above is now impossible, even if the Chalet were still standing, because the stage would block your view. 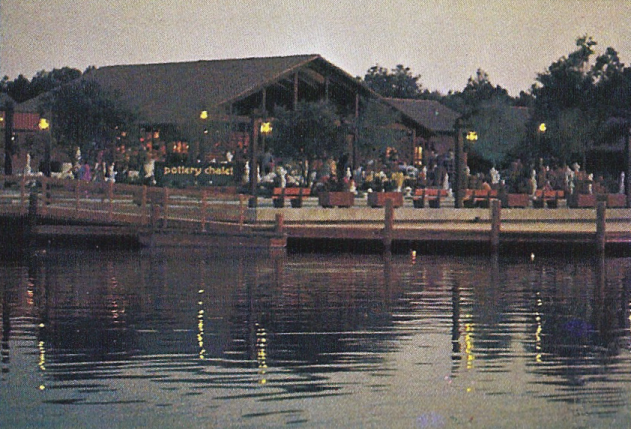 Lite Bite was later renamed the Lakeside Terrace, then later Goofy's Lakeside Terrace, and was finally replaced entirely by the current Ghiradelli Soda Shop. The layout of the actual building is reasonably untouched. This is the north-facing facade of a shop which was known as Port of Entry, selling a variety of import stuff, sort of a precursor to the many shops of World Showcase. In front of Port of Entry was a narrow little vendor which was given her own name: Cane, Rattan, Wicker & Suns (get it?). This sold a variety of wicker furniture, which was quite popular in the mid 70's. Around the side of this building is Pipe Dreams, the Village's adjunct of the Main Street Tobacconist, which both sold and repaired fine pipes. Past that: The Bath Parlor, a high-ceilinged, white walled paradise of bathroom decor and towels. 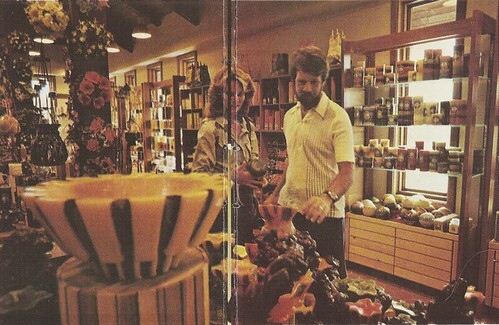 Port of Entry had become Mickey's Character Shop by the late 1980's, probably due to Port of Entry's extreme redundance in light of EPCOT Center's opening in 1982. This store paved the way for the World of Disney. The building which once housed Port of Entry is today home to Team Mickey's Athletic Club. The sun is starting to go down on the Village, but we must sadly end our tour here.... until next week. See you then! A new side project of Passport to Dreams.... see you there.